INCIDENT ADDRESS: 2724 E. Boone Ave. NARRATIVE: At 7:07 PM on Friday, February 19, 2010 the Spokane Fire Department responded 5 engines, 2 ladder trucks, 1 rescue truck and 2 Battalion Chiefs to a reported house fire at 2724 E. Boone Ave. The first crew on scene reported heavy fire and smoke from all openings of a single family house. While crews attacked the fire, other crews performed a search of the house to confirm there was no one trapped inside. The fire was knocked down within 10 minutes but crews remained on scene for several hours removing burned contents and pulling ceilings and walls, checking for any hidden pockets of fire. One civilian was treated by Spokane Fire Department paramedics for moderate smoke inhalation and was and transported to Sacred Heart Medical Center. It was not known at the time of this report whether the 35 year old male victim was an occupant of the house. Damage to the house was extensive and will not be able to be occupied until repairs can be made. PROBABLE CAUSE: The fire was investigated by the Spokane Fire Department's Special Investigation Unit and determined to be accidentally caused by carelessly discarded smoking material. DAMAGE EXTENT: There was extensive damage to the house and its contents. NARRATIVE: The Spokane City Fire Dept. dispatched fire fighting crews and their apparatus to 3004 N. Crestline at 11:38 hrs. on Wednesday, February 17th, to a reported structure fire. The first arriving fire company reported a 2 story wood/frame apartment building with heavy fire showing out the second floor windows at the rear of the structure. The Officer in charge of that first in company immediately began making assignments to the other in-coming fire crews and as those apparatus arrived on scene the fire fighters began working on those assigned tasks. 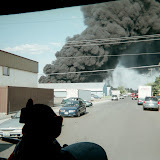 Those initial assignments included fire attack, securing a hydrant for water supply, laddering the building, search and rescue, horizontal and vertical ventilation, a dedicated back-up hose line to protect those fire fighters who have entered the building to begin fire attack in the building, exposure protection, safety, and the State mandated Rapid Intervention Team whose sole purpose on the fire scene is to be in a position to rescue injured or lost fire fighters. This was the second fire to occur in this building within the last 5 weeks, early in January of this year a second alarm fire tore through another second floor apartment on the opposite side of the building from today's fire. The entire building had been vacated because of the damage suffered in the first fire, utilities had been disconnected, and many of the windows were boarded up. The interior of this building presented fire fighters with multiple safety concerns since areas of the floor were missing and the light-weight construction of the flat roof structural assembly had been seriously compromised by the first fire. The fire was contained and extinguished as all of the pre-assigned tasks came together and were completed. There were no reports of any injuries to the fire fighters at the scene or to any civilians. Fire damage to the involved apartment was severe and the structural components of the floor and roof systems were further weakened. The long-term viability of the building will need to be determined by the building's owner and for the short-term the building will once again be secured and boarded up. The Spokane City Fire Dept. 's Special Investigation Unit was summoned to the fire scene to determine the cause of this fire. Twenty six fire fighters were delivered to this incident on 6 pieces of fire fighting apparatus, 2 Command vehicles, and 1 fire investigation truck. DAMAGE EXTENT: The fire unit was severly damaged and the integrity of the entire building is questionable because of the combined damage from today's fire and the fire which had occurred in early January of this year. Spokane Firefighter's Scott Firefighter Stair Climb Events Approaching! Hey all you news media folks - A special invitation! Come on down to the Bank of America Building (601 W Riverside) and then climb on up some stairs with some firefighters! February 19th (between 5 and 7 am) Spokane Firefighters will be on hand to lend you a hand climbing a few flights while you're "geared up" in firefighter garb. It should be fun! Just let them know you're interested, so they can bring some appropriately sized gear. Also, the Spokane Firefighter team is going to be hosting, thanks to the generosity of David's Pizza, a fundraiser on February 20th at David's Pizza (829 E. Boone). The money raised will go to the Leukemia and Lymphoma Society. The Scott Firefighter Stair Climb is an annual event to raise money for the Leukemia and Lymphoma Society. It's a race up Seattle's 937-foot tall Columbia Center's 69 flights of stairs. 1500 firefighters participate to raise funds to fight deadly blood diseases. This year it will take place March 7th. You can find more information here. For information regarding the David's Pizza fundraiser, or the Spokane media climb, please contact Jason Keen at 208-640-4240. Jack Greenamyer - 45 years of service and protection... Through excellence! Where were you in February, 1965? 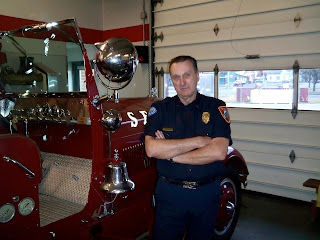 Jack Greenamyer had just joined the Spokane Fire Department. 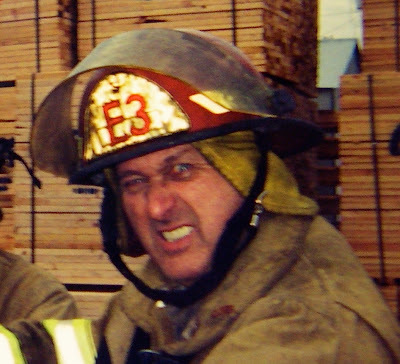 Monday, February 15th marks Jack's 45th year of fighting fires for the City of Spokane. Jack is the Fire Lt of Engine 3 on D Shift. Engine 3 is the busiest fire engine in the state, according to the 2009 Fire House survey. Jack is on-shift for his anniversary. Please come by on Monday afternoon and wish Jack well. Ask him what he has planned for 50; he may just get the day off.